Our French remodel has been progressing slowly but steadily. Our primary focus to date has been on the main house, but we've recently also begun work on some of the outbuildings. In France you're allowed to remodel the interior of most buildings, even a chateau as old as ours, without seeking planning permission. It's a very different system to the one we experienced when we remodeled our home in San Francisco, where we needed to get permission for every aspect of the renovation. However, if you want to make any change to the exterior of an old building, for example, add a window, then you must apply for planning permission. Apparently this process can be quite lengthy, and we've heard that a lot of people simply don't bother asking permission. They assume that no-one will notice the extra window, and they want to avoid the tedious bureaucratic process which may result in them not being granted permission after all. Whilst I understand this perspective, we've decided to play by the rules and submit our building plans as per the regulations - despite many grave warnings from locals! 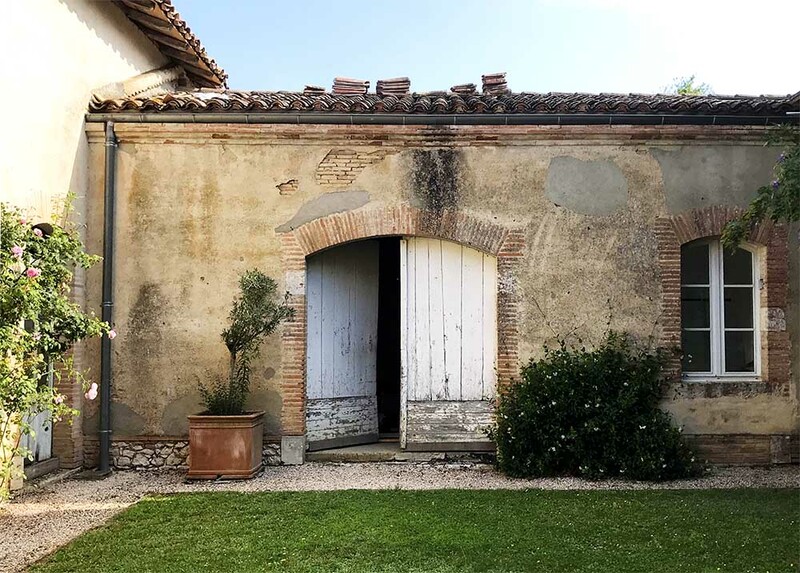 We absolutely love the front of the chateau and, other than repairing the crumbling crépi (rendering), and restoring and repainting the original wooden shutters, we won't be altering anything. The facades we hope to change are on the outbuildings, which don't have as much natural light inside as the main house. We would like to add a series of large doors and extra windows to the North, South and West wings of the property, along with an opening for a garage door. The crumbling crépi on the exterior of the chaetau. This wing of the chateau faces South, so it gets beautiful light all year. We plan on transforming this space into our living room, and we want to create three large arched French doors to open onto the garden outside. We have designed the shape of the doors to match the other original archways in the chateau, and are also proposing a row of three Juliette balconies with traditional wrought iron railings. One of the chateau's original archways that we're using as the basis for our proposed new doors. We don't currently have any undercover parking at the chateau, and our hope is to be able to create a garage in the North Wing. Rather than a straight garage door, we have designed the opening with an arch, echoing the arch doorways throughout the rest of the property. Just like on the South wing of the property, we have also proposed a row of three Juliette balconies with traditional wrought iron railings above the garage. Here you can see the back of the barn. The barn is currently derelict, and we are restoring it and converting it into bedrooms and living space. We want to make sure every bedroom has natural light, and so we are seeking permission to add 5 "œil de bœuf" (bull's eye) windows. These round windows are traditional in France, especially in buildings of this era, which is why we have chosen this style. We hope our building request is approved because the modifications we are requesting are sympathetic with the character of the chateau, and respectful of the building's original architectural details. We should hear back from the planning department in around one month. Finger's crossed!